LeadPages is probably the most popular Landing Page generator, used by many (if not all) of the top marketers. But is it right for you — or is there a better alternative to Lead Pages for making landing pages? If you’re using WordPress then yes, I believe there is a much better (and cheaper) LeadPages alternative, in the shape of Thrive Landing Pages which is a landing page Plugin for WordPress. One of the biggest objections to using LeadPages is the cost — it’s a constant monthly fee as opposed to a one-off charge — so you are forever paying for it, unlike a product that you purchase and then it’s yours forever. If you’re doing any sort of marketing, or selling things online, you’ll soon appreciate that creating proper landing pages for your campaigns is essential. Your advert, or campaign, should send people to a page that speaks directly to whatever it is they are interested in. Sending them to your Home Page or another general page on your website is not enough, you need to send them to a very tailored page that directly addresses whatever made them click in the first place. It should also contain a very clear Call-To-Action asking them to take whatever action it is that you desire, e.g. signup for a mailing list, request a quotation, or send an enquiry. And it shouldn’t really contain anything else. Just enough information to persuade them to take the action you want, nothing more. Anything else is a distraction that will reduce your conversion rate. A Landing Page that is designed to just get an email address is often called a Squeeze Page. Not a very attractive name, but it does reflect the purpose of the page, to ‘squeeze’ an email address out of someone. Unpleasant imagery but it conveys the singleminded purpose of a good landing page. What is a Landing Page creator (and why do you need one)? Given the very specific nature of a landing page, you will need to create one for every campaign that you run. If you run multiple campaigns, you will need several different landing pages, so you need a quick and easy way to create these pages. Also, for maximum effectiveness, the design of your landing pages will probably be completely different from that of your website. They will contain far less than a typical page on your website (no navigation for example), just the offer and the call to action. That means it’s not as simple as just adding another page to your site, as the layout will probably be completely different. A Landing Page Generator or Landing Page Creator makes it easy to create these pages yourself without having to hire programmers to code each page for you, and graphic designers to make them look nice. As I said earlier, LeadPages is probably the most popular one at the moment, used by lots of household names in the Internet Marketing business, and there is a natural inclination to follow the crowd. I know, I’ve done it myself. That many people can’t be wrong, right? In fact, I have bought LeadPages myself twice, and cancelled it both times! What’s the problem with LeadPages? Many people don’t like LeadPages’ continuous subscription payment model, where you have to keep on paying forever. As soon as you stop paying you lose all your landing pages, so you are locked in. They do have annual payment plans which are a lot cheaper than the monthly payment option, but it’s still a lot of money, especially if you are just starting out. Most people prefer a ‘pay once – use it forever’ pricing model, particularly if the outright purchase price isn’t much more than a month’s subscription to LeadPages. But that’s not the biggest problem for me. LeadPages comes with a lot of beautifully designed, mobile-responsive, conversion-optimised landing page templates, many of which are copies of the actual ones used by some big name marketers. Proven templates that have been tested and optimised in the real world, what’s not to like? Well the problem is, you can only customise these existing templates — you cannot create your own landing pages from scratch within LeadPages. So if there is a template that happens to fit your needs exactly, and has all the right elements (pictures, headings, text, form fields etc.) in the right places for you, and you’re happy to just edit the text and maybe change the colours etc. you’ll be fine. If you want to add a block of text, or an element that isn’t on the template, or combine ideas from another template, you just can’t do it. You can import landing pages that you’ve custom coded yourself in HTML, but that’s really defeating the object of a landing page builder! And you lose many of the LeadPages features if you do that. The templates look great (check them out), but it’s very unlikely that you will find one that suits your needs exactly. You’ll probably find yourself adapting your needs to fit the template, and that’s wrong. What you need is a Landing Page generator that lets you create your own landing pages from scratch, quickly and easily, using whatever layout and design elements you want — giving you complete control over your landing page, and making it beautiful and also mobile-responsive. You want pages that look as good as LeadPages ones, but where you can tailor them to your exact needs. Because everybody’s needs are different when it comes down to the detail. I had the solution in my toolbox all along, and I didn’t even know it! I use the excellent Thrive Leads WordPress Plugin to power all the Signup Forms and Pop-ups on my blog. It is a remarkable product, in my view far better than all the others out there (and I’ve used most of them). 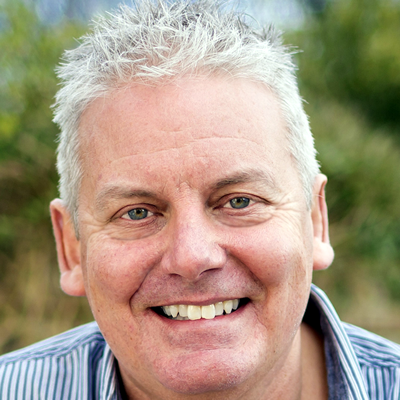 Shane Melaugh, the man behind Thrive, is just brilliant at creating products that combine all the best bits from all the competing products, adding a few things that nobody has thought of, and leaving out all the bad bits. The man’s a genius at product design and he really knows his stuff. I upgraded to Thrive Leads from his previous product, Hybrid Connect. At the same time, without really noticing, I also got Thrive Landing Pages WordPress Plugin. It’s actually intended to do far more than that, it’s a general purpose tool for building pages in WordPress using a drag-and-drop editor, that gives you a lot more control over the design of the pages than you get with standard WordPress. It makes it very easy to create beautiful pages, without any coding skills at all, and you easily can do things that even an experienced coder with good CSS & PHP skills would think twice about tackling. For making landing pages, it’s just fantastic. You have total control over every element on the page — you can put whatever you like, wherever you like, and you’re not limited to just changing the wording on somebody else’s template like you are in LeadPages. Buttons & Calls to Action – customisable, multi-style buttons. Testimonials – display social proof and boost your sales. Styled Lists – perfect for feature lists, lists of benefits etc. Table Builder – create flexible tables for reviews, product comparisons etc (no HTML required). Fully Mobile Responsive – everything is fully responsive and looks great on any screen size. Everything you need in fact to create beautiful LeadPages style landing pages, but to your own precise requirements, and with full control over the design. If you want a starting point to help you get going, Thrive Content Builder comes with some Landing Page Templates which you can adapt, and totally change to suit your needs. You are not limited to the small amount of customising that LeadPages allows, you can change everything. Thrive also comes with Page Sets – complete suites of templates for the Landing Page, Confirmation Page, and Thank You Page, all designed to look consistent and work together. 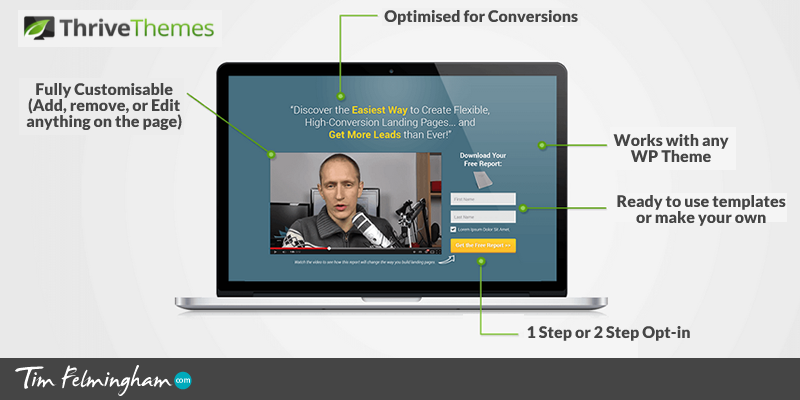 It also caters for two-step optins which is something that LeadPages have found to improve conversion rates quite considerably. There are some very good training materials that explain not only how to use the Plugin, but also the art and science of creating landing pages that really work. You can learn a huge amount about how to make a great Landing Page from them, they are almost worth the price of the product on their own. And how much does all this cost? It’s a one-off purchase price of $59 (£39) for a single site. That’s not $59 per month — you buy the product and it’s yours forever, and you keep all your landing pages and other pages that you create with it. There are other options for multi-site and agency use, and you may well find you want to bundle it together with some other Thrive products, especially ThriveLeads so check out the different purchasing options. I will be writing another article on how to use Thrive Leads to increase signups on your website very soon, so make sure you signup to my mailing list to keep informed when this is available. Head over to Thrive’s website now and take a look at what you can do with Thrive Landing Pages. There’s a short video which will show you exactly how everything works, I promise you’ll be impressed. If you have any questions about using Thrive Landing Pages to build your landing pages, please drop me a line. I won’t do it for you (I don’t do client work any more), but I’ll be happy to help you and point you in the right direction for free. When you’ve built your your Landing Pages, you will need an Email service to send your Email signups to. The two most popular ones are AWeber and MailChimp. I use both, but I prefer AWeber. I’ve written a detailed comparison of the two here in my comparison of AWeber v MailChimp which will help you to decide which is best for you. And if you want some help with building your email list, either on how to build your Email List from scratch, or how to improve your results if you’re already doing it, I have a FREE 7 Day Email List building Course which will take you through the whole process step by step. You’ll get a new lesson every day, sent straight to your inbox. It’s very clear and easy to follow, but will teach you the very latest proven techniques to get the most subscribers.